Chemistry: Ca(VO)Si4O10(H2O)4, Hydrated Calcium Vanadium Silicate. 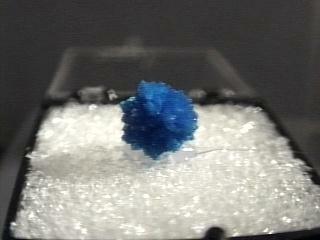 Cavansite is a beautiful and rare mineral. It was only discovered in the last 30 years and is found in only a few locallities. By far the best crystals come from the famous zeolite quarries in Poona, India. Crystal aggregates consist of spherical rosettes with jutting pointed crystals. The deep blue color of even the smallest cavansite crystals is truly amazing. A beautiful blue cavansite rosette perched on top of the muted colors of the typical zeolites makes a dramatic crystal association. Cavansite's rarity and beauty explain its recent popularity. Color is greenish-blue to ocean blue. Crystal Habits radiating acicular crystals forming spherical crystal clusters. Cleavage perfect in one direction. Associated Minerals include zeolites such as stilbite and heulandite as well as calcite, apophyllite , babingtoniteand quartz. Other Characteristics: larger crystals show an unusual internal reflection. Notable Occurrence is Poona, India and Columbia Co. and Malheur Co., Oregon, USA. Best Field Indicators are color, associations, locality and crystal habit.